Mary Lou Robinson ’50, esteemed judge, women’s rights activist, and civic leader passed away on January 26, 2019. She was 92 years old. The Honorable Judge Robinson met her husband of 42 years, A.J. Robinson, while earning a Bachelor of Arts degree from the University of Texas at Austin. After graduating from the School of Law in 1950 with an L.L.B. (now called a J.D.) Robinson returned to Amarillo and soon became an indispensable member of the Amarillo legal community. At first she and her husband A.J. practiced law together under the firm name Robinson & Robinson. In 1955, Robinson began her 63-year judicial career with her appointment as Judge of the Potter County Court-at-Law. She was elected Judge of the 108th District Court in 1961. Twelve years of distinguished service later, Robinson was appointed as Associate and then Chief Justice of the Seventh Court of Civil Appeals in Amarillo, making her the first female appellate judge in the state of Texas. In 1979, President Jimmy Carter appointed Robinson Judge of the United States District Court, where she presided for over 39 years. In 2018 Judge Robinson’s name was added to the J. Marvin Jones Federal Building and Mary Lou Robinson United States Courthouse in Amarillo. This is the first federal courthouse named after a women within a five-state area. 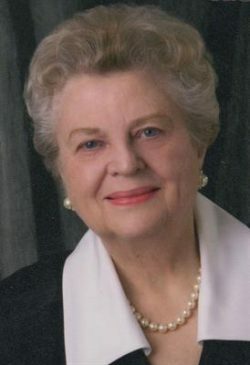 In the 1960s and 1970s, Robinson fought for women’s rights, helping to change laws that prohibited married women from entering binding contracts and assisting the passage of the Texas Equal Rights Amendment. Throughout her pioneering and distinguished legal career, Robinson was an active and engaged member of her community. She and her husband A.J. taught adult Sunday School classes at Westminster Presbyterian Church, where she was a church elder, while concurrently serving on the boards of numerous civic organizations. While the proverbial list of Judge Robinson’s awards, honors, and accomplishments is vast, she viewed her service as an honor in itself. She will be remembered by her family and friends for the invaluable lessons she taught and the endless love and devotion she so freely gave.